As the producer of Shadow’s Edge, I have a lot to be thankful for this year. It’s been quite the journey since starting our development of the game in January! Of course, it’s been exciting to produce the game, and I have also very much enjoyed the crafting of the narrative and story-line with our team. I have had the chance to work with some amazing people. At the very top of that list are our players. From the very first picture we drew of the world of Shadow’s Edge, we involved teens in what we call the insider program. 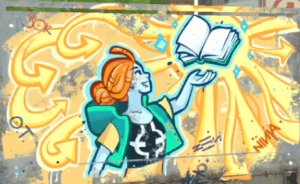 In the 10 months of development that followed, we have had more than 500 touch points with our teen experts, asking them everything from what the world should look like, feedback on the storyline, how the Guardians should behave to deeper questions about what impact playing the game has on how they feel about their illness, their environment and most importantly themselves. Over and over again, we received feedback that our teens are grateful that the game exists and it is our players’ stories that keep me getting up early after yet another 17-hour day. So many of our teen players’ stories touched my heart. Our preliminary results from our impact study with 55 teens show a 4% growth in positivity — in only 4 weeks of playing Shadow’s Edge! We are continuing our study. Just like our teens, we have big dreams at Shadow’s Edge. Imagine being able to walk through Shadow’s Edge and see your work life-size in virtual reality. Or being able to tag your virtual graffiti in the real world through augmented reality. More immediately, in answer to the requests of our players, we are growing our rewards system and giving players a greater impact on the world. We hope to bring Shadow’s Edge to teens around the world and will translate the game into five other languages to start with. We are working hard to build the community on our social media platforms with videos, tutorials, as well as tips and tricks from our designers and psychologists to build a community around our players. I am grateful for all our teens, and want to express a huge thank you to our Shadow’s Edge community for playing with us. Please don’t forget to spread the word. The game is free and we are thankful for your support in getting the word out to download our game on the Apple store and Google Play. And if you feel like it, join the communication on our social communities on Instagram, Facebook, Twitter and YouTube.